The days of mom putting dinner on the table with china while wearing her pearls and perfectly ruffled clean apron are long gone and so should be the formality of that time. Interestingly, a survey conducted by Eckrich(R), a ConAgra Foods product, found that “40 percent of American families eat dinner together only three or fewer times a week, with 10 percent never eating dinner together at all”. How often does your family eat dinner together? Is it always a rush to the finish line trying to gather everyone between after school activities and sports practices? The bottom line – develop a meal plan. Frequently, it can help. Write down your family schedule for the week. I do this on Sundays. This is how I begin to fill out my simple Meal Planning Worksheet. 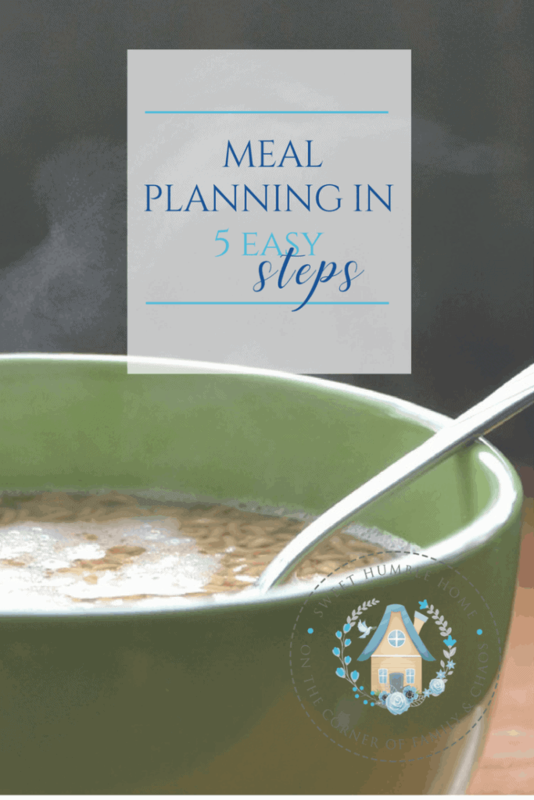 I write down what meal I plan to serve (or pick up, as the case may be), note any family commitments, and on the same worksheet I write down my grocery list. 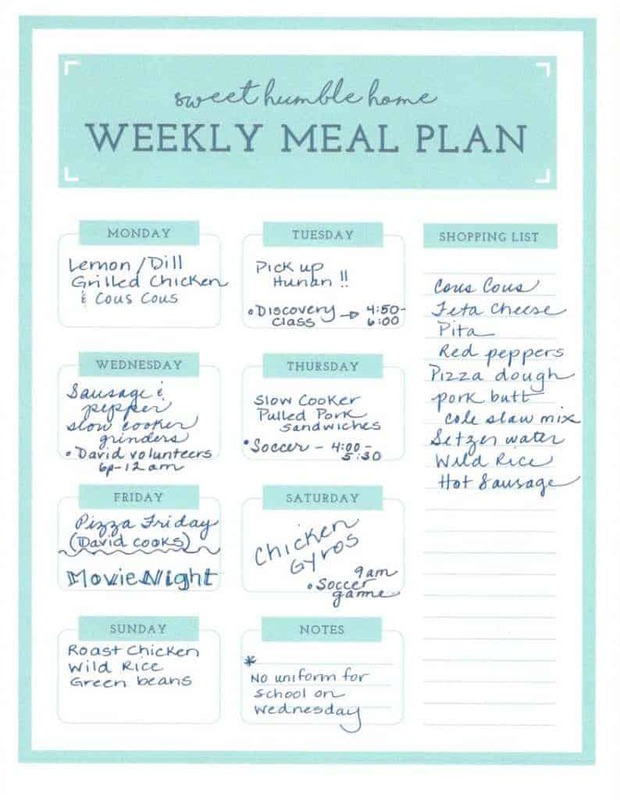 If you’d like a free copy of the Sweet Humble Home Meal Planning Worksheet, subscribe with your email address and I’ll send it to you! Below is a sample of how I fill it out. Decide on your meals. Are there family favorites? Include those. Slow cooker meals? They are perfect for family dinners when time is of the essence. Grilling? So easy! Just don’t get caught up in feeling like each day needs to be a from scratch dinner. That’s not the whole point of meal planning (at least not for me). On our busiest days the meal plan for the evening is: “pick up take out from Hunan”. As a result, I’ll also often use my slow cooker so I can just put everything in the pot before we even start our day and it’s ready when the day is done. There are millions of easy meals. 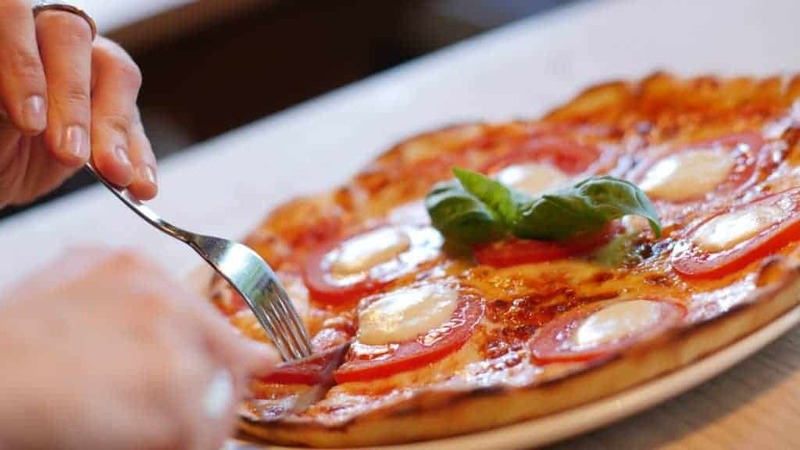 Plan on a meatball grinder, buffalo chicken salad, quesadillas cooked on your pancake griddle, frozen pizza or pizza on your grill with a fresh salad. Granted, it doesn’t have to be fancy. The point is, in fact, to sit down together and connect. Make your shopping list and get to the store. If you are looking to save money, do this step first and plan your meals around sales. This should be a big part of your meal plan. After shopping do some prep. Therefore, if you spend an hour or two prepping things like putting a freezer meal packet together, making meatballs, browning sausage, slicing veggies, marinating meats etc you’ll save a ton of time later in the week. You can find some of my favorite easy weeknight meals on my Pinterest Boards. I also have boards on soups, stews, and slow cooker meals, which are especially relevant on busy nights! Finally, keep it casual & electronic free. Grab some disposable (and recyclable) dinnerware for those crazy days. In addition, speaking of crazy – turn off all electronics for 30 minutes. You’re not going to connect with each other if you’re distracted. You can do it! Remember – the most important time is family time! In conclusion, by doing a little prep ahead of time, keeping things simple, and being flexible, it’s possible to sit down to dinner together on even the busiest of days. It just takes a little commitment and the buy in of your family. Consequently, before you know it, you’ll cherish those 30 minutes as special time with them. Im from Elite Blog Accademy. Very well written. You are off to a great start. Great post. Meal planning is a must for me. If I don’t plan we end up eating absolute rubbish. I also find that doing my shopping online helps me to stay on track and not overspend. Thanks, Wendy! I usually order my groceries online as well and also find it a huge money saver! In fact, I have a post coming out soon on how I find it so helpful!